Last night, crowds of young architecture types filled the courtyard at MoMA PS1 in Queens to meet Wendy, this year's Young Architects Program winner by HWKN. Visible from the nearby elevated subway station and from the streets around MoMA PS1, Wendy is comprised of pollution-fighting fabric spikes set in a grid of scaffolding intersecting the concrete courtyard walls. Yesterday's crowds were given special access to the interior of the installation, revealing a complex structure of poles, fans, and misters that will cool visitors this summer. MoMA PS1 will host its annual Warm Up music series in the courtyard beginning on July 7, showcasing "the best in experimental live music, sound, performance, and DJs." Wendy will officially open to the public on July 1. Meanwhile, at a taxi garage across the street, small fragments of last year's installation by Interboro called Holding Pattern are still in use on the sidewalk. Click on a thumbnail to launch the slideshow. "I cannot wait for the data to come in so we can show people," said Matthias Hollwich, a principal of the Manhattan-based architecture firm HWKN. 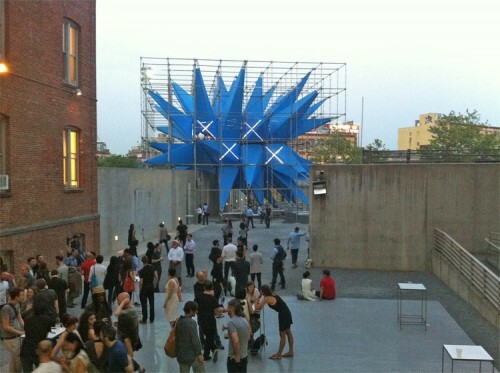 Hollwich is talking about the air quality monitoring system that will be hooked up to Wendy, the 3,000 square-foot star-shaped pavilion HWKN is currently installing in the courtyard of MoMA PS1 for the annual Young Architect's Program. Because PS1's Kraftwerk exhibition occupied the museum's courtyard until May 14th, HWKN only had six weeks to build Wendy, which will not only house a pool, a misting station, a water canon, an elevated dj booth and an exhibition space, it will "eat" smog all summer long thanks to a special little ingredient called TiO2. Developed by Cristal, a titanium dioxide products manufacturer, and Glen Finkel at PURETi, TiO2 is a titanium nanoparticle that, when activated by the sun, engages in photocatalytic oxidation, a chemical process that safely and instantly oxidizes organic matter at the molecular level and converts it into water vapor and trace amounts of CO2. Since TiO2 is the catalyst, it's not consumed in the process. When it's applied to a building, a road or, in this case, a huge outdoor pavilion, its smog-fighting properties last for a minimum of five years. And because the water vapor washes away, the treated surfaces stay dramatically cleaner than their untreated counterparts. There are several brands of titanium dioxide coating on the market, but Finkel claims that PURETi's award-winning formula is the best because it doesn't come from a powder that’s mixed in or melted down, but from a liquid (99% water, 1% mineral content) so thin, clear and durable it can bond to virtually any surface, including fabric, glass and stone. It also requires less light to function than any known competitor, and is the only photocatalytic surface treatment known to work on the north side of a building in the shade. To maximize the surface area onto which TiO2 can be sprayed, HWKN created an intricate cluster of pointed shapes and employed structural engineers from Knippers Helbig, who worked for one month to develop a "totally reinvented" cross bracing system to hold the shape of the TiO2-treated PVC-based fabric from Botex(they were originally going to use nylon but it sags over time). “Normally when you have tensile structures it has a curve, and that has been done,” said Hollwich. “We wanted to do something formally different, so the cones are wrapped around the cross bracing which gives it its stealth form.” Surrounding Wendy with scaffolding was an aesthetic choice as much as it was a structural necessity. "The fabric is being pulled from the core to the edges and to be able to hold that edge we needed the scaffolding. The form of Wendy is also the structural system.” The whole framework is held in place by forty 5-foot-long temporary ground screws by Krinner that can be unscrewed in September when the pavilion is taken down. Using an equation based on the amount of nano particles sprayed onto Wendy, the estimated sun exposure and the average pollutants generated by local Long Island City traffic, HWKN calculated that over the course of the summer Wendy's paint job will clean up pollutants from the equivalent of 260 cars. If it sounds too good to be true, the only downside of TiO2 seems to be that it's expensive, though a little bit does go a long way—one gallon can cover 4,000 square feet. Still, at 70 cents per square-foot it's no surprise that Pureti's main clients aren't homeowners, but NASA and other large institutions like Los Angeles Community College, the 2015 Milan Expo, and office buildings in London. Hollwich sayid he's "surprised that the whole world isn't using it, because it's really magical," adding that he hopes the high visibility of Wendy will encourage more people to use TiO2 in everything from buildings and roads to textiles. In fact, MoMA will be selling t-shirts and totes sprayed down with TiO2, and after the summer programming is over Wendy herself will be cut apart and sewn into smog-fighting bags.